Gates married Melinda French from Dallas, Texas on January 1, 1994. They have three children: Jennifer Katharine (1996), Rory John (1999) and Phoebe Adele (2002). The Gateses' home is an earth-sheltered house in the side of a hill overlooking Lake Washington in Medina, Washington. According to King County public records, as of 2006 the total assessed value of the property (land and house) is $125 million, and the annual property tax is $991,000. 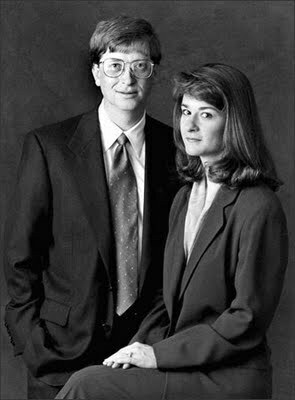 Bill and Melinda French Gates were married on January 1, 1994. They have now three children, one is Jennifer Katharine Gates, who was born in 1996; and a son Rory John Gates, born in 1999 and a daughter, Phoebe Adelle Gates, born in 2002. Melinda French Gates (born Melinda Ann French on August 15, 1964) is an American philanthropist. She is the co-founder and co-chair of the Bill & Melinda Gates Foundation and a former unit manager for several Microsoft products such as Publisher, Microsoft Bob, Encarta, and Expedia. 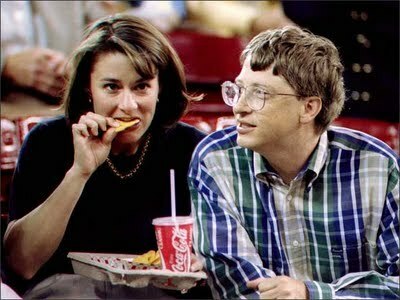 In 1994, she married Bill Gates, founder, chairman, and former chief software architect of Microsoft. They have three children: Jennifer Katharine Gates (born 26 April, 1996), Rory John Gates (b. 23 May, 1999) and Phoebe Adele Gates (b. 14 September, 2002). lthough they live a life of privilege and power, Bill and Melinda Gates are working together to give much of their wealth away. Through interviews, Bill and Melinda reveal their thoughts about marriage, working together, and raising their three children. William Henry Gates III: October 28, 1955 in Seattle, Washington. Melinda Ann French: August 15, 1964 in Dallas, Texas. Bill and Melinda met in 1987 at a Microsoft press event in Manhattan, New York. Bill proposed marriage to Melinda in 1993 when he "secretly diverted a chartered plane they were taking home from Palm Springs one Sunday night to land in Omaha. Warren Buffett met them there, arranged to have a jewelry store open, and helped them pick a ring." Bill and Melinda were married on January 1, 1994 on the Hawaiian island of Lanai. The island has no stoplights, has 47 miles of coastline, lots of white sand, and is only 18 miles long and 13 miles wide. To insure their privacy for the day of their wedding, Bill rented every hotel room at the hotel (250 rooms) and chartered every helicopter close by. Bill and Melinda's $1 million, 15-minute, seaside wedding ceremony took place on the 12th tee of the Manele Bay Hotel golf course. William J. Sullivan S.J., Seattle University Chancellor, was the presider of the wedding ceremony and Steve Balllmer was Bill's best man. Bill wore black slacks and a white dinner jacket. Melinda wore a $10,000 wedding gown designed by Victoria Glenn of Seattle. The white dress was made out of silk-faced organza. Wedding guests numbered approximately 130 and included Warren Buffet, Paul Allen, Craig McCaw, and Katharine Graham. Willie Nelson entertained the Bill and Melinda and their guests at the wedding reception.